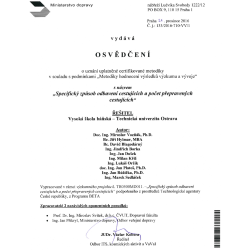 On 21st December 2016, Ministry of Transport of the Czech Republic released a certificate of approval of certified methods. This certificate describes a method for determining the traffic performance from location and operational mobile network data. The usage of this methodology is mainly in public transport where is necessary to determine the number of transported passengers and also determine the number of specific carriers due to traffic flow performance. Methodology “Specific method of check-in and number of passengers” is the result of research project no.TB0500MD011, realized within the program of public orders in research, experimental development and innovations for the state administration needs “BETA”, Technology Agency of the Czech Republic.